Wondering which is the best hydration pack to carry with you as you go for that hike? Or are you simply looking for a means of doing comfortable modern mountain biking? 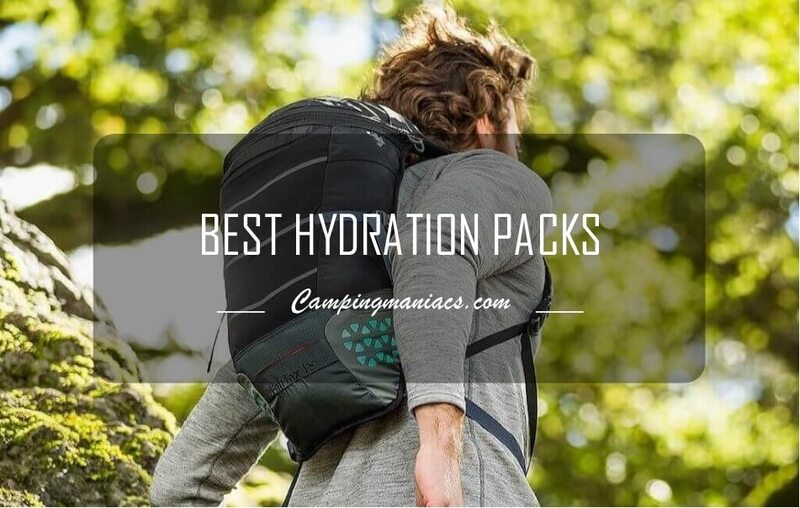 We researched over twenty of the best hydration packs, carried out tests on them and came up with the list below of the top 10 best performers. For the packs, our tests looked at durability, comfort and fit, cost, ventilation, storage capacity, versatility, and their user-friendliness. For their reservoirs, we looked at water capacity, the level of insulation, and even the minute details like the type of their bite valves. These packs were used in severe weather conditions, long days and nights, and rough terrains to see whether they could stand such extreme tests. The packs were tested on men and women of different sizes to examine their fit. Only after we were satisfied with the results did we then create this list of the top ten best hydration packs. So, whether you are hiking, biking, kayaking or taking part in military manoeuvers and need a means of hydration, these are the packs to purchase based on your needs and the outdoor adventure you are partaking. If you are otherwise looking for hydration bladders instead, we wrote a comprehensive review of the top-rated hydration bladders and you can check it out. Which are the best hydration backpacks? See how our top picks of the hydration packs performed below as we delve into the best performer in each category. 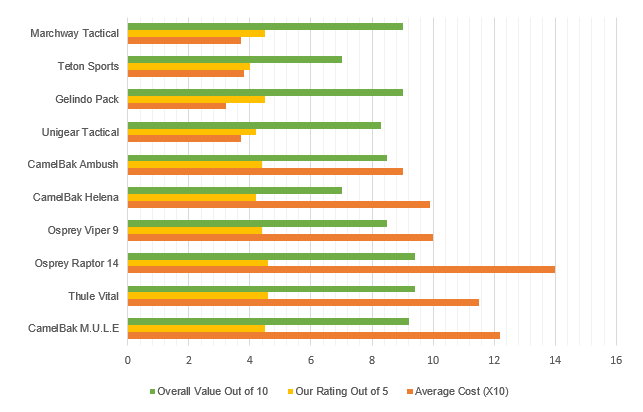 Don't let the chart scare you; it's a quick way of guiding you to your perfect hydration pack putting into perspective the cost, our ratings and the overall value you are likely to get from each hydration pack. It will ease your navigation by far. 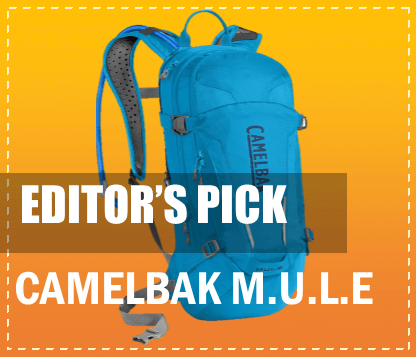 This pack from CamelBak, going for between 106 and 138 dollars at the time of this writing, emerged as our top performer in the category of water intake. Its reservoir is designed in such a way that it delivers 20% more water than your average water reservoir. You can feel the difference when you really need that quench. However, this could be discouraging if you want to limit your water intake. The CamelBak M.UL.E is endowed with the new Crux reservoir which has a storage capacity of 3 liters of water. In spite of this, it is lightweight. Even more thrilling is the fact that the water temperature remains cool after hours of hiking. The reservoir’s cap is not only easy to open but also leak-proof meaning that you do not have to worry about water spilling as you hike or ride. Your water and pack’s security is also guaranteed as the CamelBak Crux Reservoir has an on/off valve that shuts water flow completely when off. Even if the pack is thrown across the ground, you are guaranteed that any liquid spillage will be the least of your worries. However, the lid of the bladder has to be lined correctly for this guarantee. We highly recommend the synthetic CamelBak M.U.L.E hydration pack as it is especially equipped to make hiking and mountain biking more comfortable with no unnecessary addition. With an overall capacity of 9 liters, it weighs 1.37 pounds and measures 17.9 by 8.7 by 8.9 inches. It has a total of five compartments allowing extra storage of food and other tools as best suits you. The storage compartments for this pack are thoughtfully-designed as you can organize your keys, wallet, snacks, and clothing accordingly. The pack is also waterproof meaning whatever you store in it remains safe in case of rain or water splashes. The six colors that this hydration pack features blend in really well with the natural environment. You can choose the atomic & pitch blue pack, black, charcoal & teal, laser orange, pitch blue & red or the racing red & pitch blue pack. CamelBak MULE has distinguishing features such as a magnetic tube trap that holds the drinking tube in place and allows you to drink without having to take your eyes off the trail. Essentially, we found that the reservoir is easy to drink from due to this feature. The reservoir’s cap’s width enables easy refilling and cleaning. Its user-friendliness extends into sealing it as the cap closes tightly with just a few twists. Get this, you do not have to disconnect the entire drinking tube from the pack in order to refill the reservoir. By just pressing the button that links the tube to the reservoir, the two can be disconnected and then reconnected after refill. If you have health concerns about the growth of bacteria within the tube then this pack is especially designed for you as it has anti-microbial hydro-guard coating which prevents the growth of bacteria. It is entirely free of BPA, BPS and BPF. You can easily manoeuver with the pack on your back in addition to having external helmet hooks which ease your biking experience. The belts of the pack are also easily adjustable which means that even if you are petite, there shouldn’t be a worry for you. One of the most satisfying features of this pack is the air director panel that it is equipped with which direct air to your back to keep it cool. With this pack, you will not only be well hydrated but also comfortable with it on your back. We however found that although the reservoir still maintained the cool temperature of the water, its tube is not insulated and it would heat up especially during hot weather. Moreover, while filling and refilling the bladder is easy, it was returning the bladder into the pack that we found a bit hectic. Nonetheless, this pack is definitely worth investing in. We rate this pack at 4.5 out of five stars. This pack from Thule was our top pick for comfort due to its low center of gravity design and easy to reach jersey style pockets. It comes in three sizes – Vital 3, Vital 6 and Vital 8 which hold different capacities of water as well as other essentials. For the purpose of this review, we tested the Vital-8 pack. It is designed especially for long hikes and riding as it is tailored at optimal weight to reduce straining on muscles. Straining is also reduced as the pack is designed at a low center of gravity making weight evenly distributed. The convenience of this pack does not stop with the amount of water but extends to the jersey style pockets at the sides of the pack. These allow you to access nutrition or even tools without having to stop and interfere with your riding. At the time of writing this article, this hydration pack goes for between 89 and 140 dollars – depending on size you pick - and comes in Moroccan and obsidian colors. Made of nylon, the largest of the three-size options of this hydration pack is the vital 8 pack that weighs 19.4 ounces and is 23 by 10 by 44.5 cm in dimensions. It also comes with a 2.5 liter hydrapak reservoir. The Thule Re Trakt hydration hose is especially convenient and safe as you do not have to remove your hands from the bicycle bars or slow down on your hike while drinking. Just like the CamelBak, it has a magnetic design that automatically falls back into place till you need the next sip. With this pack, because its bladder is precisely calibrated, we found that it was convenient as you can choose whichever amount to put into a reservoir and add it to the pack. The amount of water you carry is therefore up to you! What we observed to distinguish this pack from the pack was its expandable storage space that can fit up to 8L of cargo. With a little adjusting, the pack can carry a variety of cargo depending on your needs. Its interior has equipped storage loops that are organized for a range of equipment such as cords, keys and other accessories. Other pockets are soft-lined and suitable for delicate materials such as phones and sunglasses. We were thrilled by the fact that this pack has a sternum strap that runs on your chest connecting your shoulder straps and keeping the whole pack in place while cycling. This feature is especially handy as it enables comfort on any terrain by keeping the pack in place. There was no need to readjust our straps at halfway as the weight remained evenly distributed. Our female testers were however not as comfortable with the chest straps which were either too low or too high. Furthermore, for some of our testers, the hose length was too short requiring a certain posture to correctly drink from it. Our thought is that this can be a perfect hydration pack if you are certain that it can fit your size. The pack is definitely worthy its price and we rate it at a 4.6 out of five stars. This pack from Osprey is especially designed for females. It is our top pick for extra storage and convenience due to the helmet and blinker attachments that it has on its exterior. The pack that goes for 140 dollars at the time of this writing comes in black, Persian blue and red pepper colors. It weighs 1.9 pounds and measures 10 by 9 by 9 inches. As for storage capacity, it has 3 interior pockets and 5 exterior ones. A stretch mesh for attaching a layer at the bottom of a big climb is also guaranteed with this pack. The pack has a 3 liter Hydraulics reservoir that has specially designed baffles within to reduce liquid movement when going at high speeds. Refilling is easy as it has zippered sleeves that facilitate easy access. The hydration sleeve houses the reservoir. Just like the CamelBak and the Thule, it also has a magnetic disk that holds the strap in place. The difference however is that while the other two tubes are held over the shoulder straps, this pack’s tube runs over the right shoulder and ends at the sternum strap allowing easy access to the bite valve. Its front stash pocket safely holds sunglasses or phones as it is scratch free. Other pockets are located at the hip belt allowing easy access to items often required. Thanks to its Bio-stretch harness and hip belt, riding on rough terrains is eased. It also has a LidLock attachment where helmets can be securely held as well as a blinker light attachment located at the base of the front panel. This attachment is particularly useful as it aids quick blinker light attachment when going through dark routes. The pack has a roll-out tool pouch that eases tool organization and access in case of mechanical problems while on the trail. If you are looking for a pack that eases attachment of bike essentials and keeps you hydrated and comfortable on that rough terrain then this is just the pack for you. Versatile as with the removal of the bladder, this pack can be used as a normal backpack with the hydration bladder reinstalled later accordingly. You can carry books and a small laptop. However, it is not wide enough for a binder. It however has no mesh to prevent sweating as our testers had sweat sticking on their backs after long hikes and rides. It is also not waterproof therefore if you want to protect yourself from the rain then Osprey sells a rain cover separately. The great thing about Osprey is that they have the ultimate guarantee. The company repairs any functional defect free of charge regardless of when it was purchased! Great deal, right? It gets better! If the defect is irreparable then your pack will be promptly replaced. We gave this pack a 4.6 star rating for having an edge over other packs with exterior attachment areas for outdoor necessities such as a blinker and helmet for cyclists. This pack from Osprey is our first pack in a category of those packs costing 100 dollars and below. It scored very well in the comfort category as the upper side compression straps do a good job at stabilizing the load. By the time of this writing, this pack goes for 99.95 dollars. It weighs 1.21 pounds and is 18 by 9 by 7 inches. With a storage capacity of 9 Liters, it comes in wasabi green, blaze orange and basalt black colors. This storage is separate from the compartment that holds the reservoir. We observed and tested that the storage space is reasonable as a small camera, keys, snacks and even essential tools could be carried. The pack is especially designed for hiking along steep terrains as its foam frame-sheet evenly distributes across the back panel of the bag which also happens to have a mesh that ensures proper ventilation. It has a Bio-stretch shoulder harness that is fit to perfection and the hip-belt is removable. It is user-friendly as it has upper side compression straps which enable extra load stability if you are carrying extra weight. Additionally, it has a key clip or hook inside the lower compartment. It is similar to the Osprey Raptor 14 in that it has a scratch-free pocket for sunglasses, a magnetic bite valve system, front pocket, blinker light attachment, and a LidLock helmet attachment. It also has internal bike pump storage loops. However, its water capacity is slightly lower as it comes endowed with a 2.5 liter hydraulics reservoir. Even so, with the reservoir and other tools in place the pack was still lightweight. Our testers however complained that its hose was tough to pull off and pulling the water through the hose also required quite a bit of effort. We also observed this pack’s water system is a bit tedious as you have to pull the reservoir out of the bag in order to refill. Even so, the pack is perfect for daytrips and we rate it at 4.4 stars out of five stars. This pack from CamelBak is our top ranker for female hydration backpacks owing to the S-shaped harness. It comes in deep teal & hot coral, navy blazer and red dhalia & Stone blue and is worth 98.99 dollars at the time of writing this review. Its dimensions are 18.9 by 10.4 by 9.8 inches, weighs 1.5 pounds and has a water capacity of 2.5 liters. This pack is suitable for all-day hikes as its side pockets can hold two more bottles of water just for that. It is especially tailored for women with its S-shaped harness and short back panel which fits comfortably around the chest area. The pack’s main compartments and other essential pockets have enough room for a one day peak climb as it has organized pockets which provide room for extra layers for an all-day hike. It has a waist belt that ensures a stable and secure climb, a load bearing hip belt for easy access to essentials and an open mesh which maximizes breathability. Supplies can also be easily and hastily accessed as it is facilitated with extended exterior pockets. It has a breathable back panel for that comfortable and lightweight travel with little to no sweating at the back. Its crux reservoir which enables 20% more water per sip has an ergonomic handle that eases refilling and the on/off lever that prevents leakages. However, one has to lock the mouthpiece to avoid leakages. It also has external attachment points where you can attach your trekking poles. We found this feature to be extremely resourceful as compared to other packs which lacked it. On the flip side, for a pack that is especially designed for females, our larger chested female testers complained of discomfort with the top chest strap. This product from CamelBak has a lifetime guarantee which enhances its long-term value. All in all the Camelbak Women’s Helena 20 is great for hiking and travel and we rate it at 4.2 stars out of five stars. The pack that goes for 89.77 dollars at the time of writing these reviews, comes in black, coyote and multicam colors and is 18 by 8 by 4 inches. It weighs 1.57 pounds and is unisex. Its MIL spec antidote reservoir provides adaptability for changing missions or simply in combat environments. The reservoir has a water capacity of 3 liters and is removable therefore you can install your reservoir of choice. It is very lightweight while its durability is guaranteed as its front panel, shoulder harness and extension are made of 500D corduroy fabric while the back panel is made of 420 D high density nylon. Other features include a QL hydrolock bite valve of its reservoir, an adjustable chest strap in place of a waist belt that ensures stability and side release shoulder straps which enable fast removal of the pack. It has an external fill access which means that you do not have to remove the pack in order to refill. The drinking tube has more routes as it can either go over the shoulder or under the arm depending on your preference. However, the shoulder straps are not padded and it has no ventilation system at the back. Additionally, its storage capacity may not be enough as the pack itself is compact. Its external zip pockets at the top and bottom of the pack for essentials are also somehow squeezed. This CamelBak pack is great for hiking and mountain biking. We rate it at 4.4 out of five stars. This product from Unigear makes its debut as a worthy hydration backpack worth less than fifty dollars. It is our top pick for durability as its material is very resistant to tears allowing it to withstand rough encounters. At the time of this writing, it is priced at between 36.99 and 37.88 dollars. Made of nylon material, it weighs 3.4 pounds and measures 19 by 10 by 1.5 inches. The pack comes in Tan, black, acu, and CP colors and has an overall pack capacity of 15 liters. The pack is made of 900-denier rip-stop polyester which is resistant to abrasion, has two front pockets and a hands free hose. Not only is its back air meshed but also the shoulder straps which then allow good airflow leaving you comfortable as you engage in outdoor activities. Its main compartment is for its Tactical TPU hydration bladder which has a holder for either a wide-mouth or small-mouth water bladder. The wide mouth is easy to fill and refill. Its waist and chest straps are adjustable making it favorable for both adults and kids. The waist belt expands up to 45 inches. These straps are also great for stabilizing your load. It also has a whistle buckle for use in case of emergencies. Its features include a single top pocket with a Velcro patch on its front while its bottom pocket has three mesh pockets with an extra clip for keys. Water temperature remains cool with this pack’s bladder whose wide screw caps allow the immersion of ice cubes keeping you cool through that day of hiking, cycling or biking. As compared to other packs with a magnetic feature, its mouthpiece and cover are held by friction putting it at a disadvantage. The pack with a MOLLE system is excellent for hiking, running, biking, walking or climbing. We rate it at 4.2 stars. This unisex pack by Gelindo is our top pick for storage capacity and insulation. It is our best overall for a hydration pack below 50 dollars as it has impeccable storage space and ensures the water temperature remains cool and favorable. At the time of this writing, the Gelindo pack is worth 31.99 dollars. It measures 18 by 11.4 by 3 inches and weighs 1.9 pounds. It comes in black, dark orange, dark purple, navy blue and orange; with a BPA-free and leak-proof bladder which can hold 2.5 liters of water. With this pack, your liquid remains cool for up to four hours due to a special insulation compartment that prevents heat transfer between your back and the bladder. There are a plethora of storage compartments that this pack comes with making it the ultimate choice if you are looking to store a lot of items for your outdoor activity or if your activity is going to be day-long or overnight. The storage layers entail four large compartments, built-in layers as well as tailored pockets. The storage capacity can hold a towel or an umbrella in its zip pocket at the front. In the same way, the main and secondary compartments can hold items such as a first aid kit, raincoat, outdoor caps, iPad or emergency clothes. Your comfort while hiking is ensured as the pack’s back panel is concave in shape while the shoulder straps are easily adjustable. The easy adjustment further ensures that even when the pack is fully loaded, you remain comfortable carrying it. The pack however has no ventilation system meaning that although the water remains cool, one can sweat just as easily. This pack has 100% satisfaction guarantee and we rate it at 4.5 stars out of five stars. The pack is comes in olive green, orange, bright green, black and bright blue colors and is 16 by 10 by 2 inches. It is made for unisex adults and weighs 2 pounds. With an overall capacity of 18 liters, the backpack is lightweight. It however holds less water as its bladder carries 2 liters of water. If you are keener on water intake then you should have this capacity in mind. We observed that unlike other bite valves, its bladder has a push-lock system and it is wide enough (2 inches) to immerse ice cubes and allow easy cleaning. The advantage that it has over other packs that are not water resistant or equipped to do so is that this pack has a sewn-in rain cover located at the bottom of the pack. Therefore, pack as well as the gear inside it remain dry when it rains. Even more rewarding is the fact that you do not have to worry about losing the cover on the trail as it is attached to the pack. Other features include a butterfly opening which is suitable for jackets and a bungee cord system for bike helmets. The chest, back, waist and shoulder bands are adjustable making it easy to fit accordingly while comfort is ensured as it has a low profile. The shock absorbent chest strap and a waist belt that expands up to 60 inches are additional features in place for this hydration backpack. It also has multiple compression straps that put the pack in place and reduce bounce when hiking, cycling or backpacking. Comfort is further ensured with an air mesh back panel that allows steady ventilation on your back. The High density notch foam stabilizer makes it wearable all day long. In addition, it has a safety whistle which is especially handy during unsafe encounters or overnight adventures. However, leaking is possible if the hose located at the base of the bladder is not tightly sealed. We found that the O-ring gasket has to sit down at the receiver to ensure proper sealing. Unlike other packs with a lifetime warranty, this product has a limited warranty as the bite valve, reservoir and drink tube are covered against defects for up to one year. Good for day hiking, we rate this pack at a four out of five stars. This product from Marchway is worth 36.99 dollars at the time of this writing and comes in Black tan and ACU, and is 19.7 by 8.7 by 2.6 inches in size. It ranks very highly in the insulation category as not only is its bladder insulated but also its hose! The TLU water bladder it comes with has a capacity of 3 liters of water and is sufficiently leak-proof. Both the bladder and its hose are thermal insulated and made from TPU. This ensures that your water temperature remains cool while the material is further more hygienic and bending resistant as compared to PVC material. The pack is very compatible with most bladders as it can hold either large or small ones. For its price, water storage capacity is very convenient. Refilling the bladder is also easy as the hose can be detached and water directly filed into the reservoir. The water inlet being 9cm large allows easy immersion of ice cubes as well as easy cleaning. We enjoyed the hand- free drinking it provided as you only have to bite the bladder’s mouthpiece. The cloth of the pack, its zipper, buckle and webbing are designed with high grade material which makes it durable. The cloth is water resistant meaning that your gear remains protected from rain. This resistance is owing to the heavy duty 1000 denier water repellent nylon that it is made of. It has a middle groove that keeps the bladder flat making it easier to place into the backpack. Has two front pockets for extra storage of personal items. Comfort is ensured as the shoulder, waist and chest straps are adjustable. The Molle suspension system further expands enabling the attachment of more items. The three breathable mesh pads located at the back of the pack allow rapid air flow making the carrying experience not as tiresome. Made to fit 26 to 51 inches chest, it is an affordable pack with features that make it suitable for outdoor activities. Some of the bigger men complained that the waist straps although adjustable could not fit them. Though a low-budget hydration backpack, we rate it at 4.5 out of 5 stars since it performs spectacularly compare to the others in its category. At the end of our test, we observed that most of the hydration backpacks are designed with the reservoir in mind. Indeed the liquid capacity was reasonable for all packs, ranging from 2 liters to 3 liters. The storage capacity of the packs was another important consideration while designing these packs as most of them had extra storage capacity in addition to the main compartment hosting the reservoir. However, what distinguished the packs is the extra effort that was made to ensure the users’ comfort. For instance, the Marchway tactical Molle pack has an insulated bladder and hose while the Thule which is much more expensive has a low center of gravity design. With our very detailed tests, it is easy to determine which pack best suits you and your needs. Below are the factors to consider while shopping for the best hydration backpack for that ideal hiking experience. This is perhaps the most important consideration when choosing your hydration backpack because there is simply no point in purchasing a backpack that you cannot carry. Note that some backpacks are adjustable while others come in a standard size. Some packs are made to fit men while others are exclusively for women. In the same way, some are made for adults and would not be suitable for kids. As for waist size, most range from mid-20 inches to mid-40 inches. The ideal pack is one that fits your torso length and has a comfortable grip on your hips. Ensure that the pack fits your torso length and hip size while choosing a hydration backpack. The more the storage space the better for a hiker as you require more space for your gear. Because you need essentials such as a first aid kit, extra clothing and rain gear, then you need a hydration pack with enough carrying capacity. The best hydration pack is therefore the one with ample storage space. For hiking, the ideal capacity is 710 fluid ounces. Important features include the type of valve, wideness of the mouth opening, tube clips and the tube portal. Depending on the length of your hike, the size of the reservoir is also very important. For instance, adults require 34 ounces of water for every two hours of hiking. However, water needs usually vary depending on one’s body weight. Know your body needs and consider how long you will be outside and whether it is possible to get a refill along the way. These will dictate the amount of water you will require. Most hydration pack reservoirs hold 70 to 100 fluid ounces. Consider whether the reservoir is leak-proof or not as you do not want to slow down along the way due to such issues. Some reservoirs have measurements that indicate how much water you have consumed and this may manage your intake and alert you of any leakages. A good reservoir should also have a steady flow rate of water. Consider the type of reservoir a pack has because it plays an important role in your water intake. Consider how much the pack weighs when full as you do not want a pack that will slow you down during your hike. This weight is a total of the weight of the pack by itself, the amount of liquid the reservoir can carry when full and the size of your cargo. When determining your pack weight, bear in mind that a loaded hydration backpack should not weigh more than 20% of your body weight. This means that if you weigh 200 pounds then your hydration backpack should not exceed 40 pounds. Some packs may be designed in such a way that weight is evenly distributed so that you can easily manage to carry the pack when it is full. For instance, a low center of gravity design will keep the weight away from your shoulders and ease the weight. While looking for the best hydration pack, take note of the weight of the pack and whether there are deliberate inclusions to ease the pressure off of your shoulders. There are a lot of factors that determine the user-friendliness of a pack. For instance, is the reservoir easy to clean and refill? Does sloshing occur from a certain reservoir or is it minimalized? Is the valve or drinking tube easy to drink from or not? User-friendliness is enhanced by features such as a magnetic design that keeps the reservoir’s hose in place or a hose that automatically falls back into place after sipping from it. These features might seem minor but they significantly affect your hiking experience. Water temperature is important especially as you need that quench during and after your hike. One of the best means of determining the insulation method of a pack is by simply looking into whether the bladder and hose are insulated or not. The advantage of insulated bladders or foam insulation around the bladder’s hose is that your water will not freeze during winter and neither will it heat up rapidly in hot conditions. Some packs have insulated bladders while others have both the bladder and its hose insulated. The difference is that with an insulated bladder, the heat from the hose might affect the temperature of the water as it passes through. Thus, having a pack with both its reservoir and hose insulated is a good indicator of a good hydration pack. In the same way, some pack may have reservoirs with a wide cap which enable the inclusion of ice cubes while other can only hold liquids. Although handy, these inclusions add to the weight of the pack. While hiking, it is crucial to consider how comfortable you are. In as much as there are important pointers such as the correct posture while going down a slope, there are other determinants that either enhance or hamper your comfort. The features that are designed and added precisely to enhance your comfort while hiking include padded shoulder straps, a waist belt, sternum straps, a hip-belt and load lifters. A good way of determining whether or not a pack will be comfortable is to look at the fit of the shoulder straps. The best shoulder straps should fit closely in order to hold the pack against your back and keep the load forward. The load should not be felt on your shoulders as this will tire you faster. A waist belt helps stabilize the load and is extremely resourceful if your pack weighs more than 6 lbs. when full. Sternum straps keep the shoulder straps in place and enhance your comfort. A hip-belt is another feature that will increase your comfort. After putting the pack on your back, the hip-belt should be resting over your hipbones. For the best hydration pack, the weight of the pack should be more on your hips than on your shoulders. Load lifters are another feature on the pack that will enhance your comfort. They are usually located below the top of your shoulder and should be angled at 45 degrees towards the pack. They release weight off of your shoulders just by gently tugging on them. You do not want to buy a pack that will serve a one time purpose especially if hiking is a frequent activity for you. It is thus advisable to purchase a hydration pack that will save you from future costs. The durability of a pack is heavily determined by the type of material used to make it. The type of material dictates whether the pack is water-proof or not, breathable or not, lightweight or heavy and whether or not it is resistant to abrasion. Most packs are made of nylon or polyester thus you have to distinguish each from the other and which suits you more. Nylon takes longer to dry due to the fact that it absorbs more water. Polyester is thus more breathable than nylon. This feature makes polyester hold more color or dye as it expels water faster and withholds the dye as compared to nylon. Nylon and polyester fabrics are usually measured using the standard means which is a Denier. A single strand of silk is the equivalent of one denier. This measurement (denier) signifies the linear mass density of a material. Its quantity therefore indicates the strength of a fabric in comparison to another. The higher the Denier value, the stronger the fabric. Does the pack serve as a hydration system only or can it be used to hold other essentials other than water? The best hydration backpack is therefore the one that has enough room to store hiking necessities. In this way it is not only serving as a hydration pack but also as a storage space for other essentials. Another key way to assess the versatility of a pack is looking at whether it is water proof or not. While hiking, even though you may have planned ahead and determined that it is unlikely to rain, the unpredictable nature of weather is that it may rain impromptu. Therefore, a multi-functional hydration backpack is one that will protect your gear from the rain. Some packs are made of water-resistant material, other come with rain covers while others require separate purchasing of a rain cover. The value of a hydration pack goes beyond its cost. Ask yourself, is the hydration backpack that I’m purchasing worth its price? To determine the worth of a hydration pack, look for the extra features that make it different from other packs. Which additions make the pack in question more resourceful as compared to other packs and are the features appealing to you or not? For instance, a pack that is costlier might be priced so due to features such as more storage space, a reservoir that has more liquid capacity or an insulated design for its drinking tube. On that note, a pack with features such as an attachment area for your trekking poles is a good indicator that the pack is definitely of value because this means that the pack was designed with your needs in mind. Extra features such as an attachment area for trekking poles may not be salient but they enhance the value of a pack. If these features are present then the pack is definitely worth its cost. The best hydration backpack is therefore the one that has these factors. Make the right choice and have a great time hiking!